Cat Collars & Matching Leather Bracelets | Original Designs - Superpipapo: In Style with Your Pet! In Style with Your Cat! 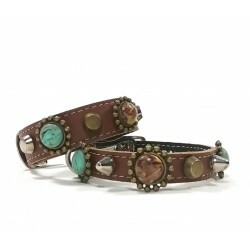 Cat Collars with Leather Bracelets There are 5 products. This collar for cats, as the bracelet, is decorated with pretty pink and fuchsia leather patches and rivets. 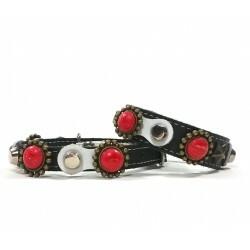 With this leather cat collar and bracelet with studs, safety clasp and Red Coral style Polaris stones, your cat and yourself will be trendy looking! 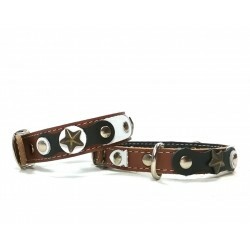 This cat collar as well as the bracelet have a sturdy look caused by its beautiful black and white leather patches. The stars break style and make it also very playful. 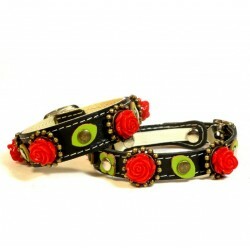 An original cat collar and bracelet with beautiful red roses in ornaments and green leather leaves on black leather. Your dog and you become famous with this design!